The Howard School, founded in 1912, is now housed along Foothill Road in Carpinteria. The Howard School, which opened in September 1912, is one of the oldest private schools on the South Coast. It was the brainchild of Hannah Howard, who began the school to supplement her family’s income. The first campus was located on South Jameson Lane in Montecito. The main building had originally been a restaurant, the Grove House, which was operated by the Alfred Jacoutot Jr. family in the 1890s. After the Jacoutot family had moved on, the Grove House developed a shady reputation under the name Channel City Suburban Club, a restaurant and tavern that apparently also dabbled in prostitution. The sheriff shut down this operation in 1908. John and Hannah Howard arrived in Montecito shortly after the 1906 San Francisco earthquake. Natives of Canada, Hannah had taught school in Winnipeg and John had earned a pharmacy degree at McGill University in Montreal. The couple moved to the San Francisco Bay Area, where John hoped to open a drug store. The 1906 quake trapped him in a building for two days, and his health remained delicate from that day forward. After their arrival here, the family operated a small farm, and in 1911 opened the Tea Kettle Inn. Hannah also began tutoring, which was so successful she decided to open a school. Enrollment in The Howard School that first fall stood at six students. By 1914, attendance stood at 75. Hannah closed the inn to concentrate on the school, and her daughters, Isabel and Esther, soon returned from college to take up teaching duties. For years The Howard School was the only private school in the Montecito area. By 1922, enrollment growth and increased traffic on the Coast Highway necessitated a relocation and the school moved to 260 San Ysidro Road. During the 1920s the school operated kindergarten through eighth grade with a maximum of 10 pupils per class. The curriculum was difficult, with emphasis on literature, drama, and art. Instruction in French began in the first grade. Outside instructors were brought in on a weekly basis to teach courses in science, physical education, and other disciplines. A few students boarded at the school, and most students were girls, although boys did attend kindergarten through second grade. Hannah Howard retired in 1942. Esther and Isabel continued on until 1951 when they sold the school to Warwick and Eileen Carpenter, both of whom had taught in local schools for a number of years. The Carpenters accepted boys in all grades and boosted the number of boarders. Average enrollment climbed to around one hundred. The curriculum remained challenging; second graders often wrote 10-page papers. The Carpenters enforced a strict dress code; attire for the boarders’ Sunday dinner was coat and tie for boys and fine dresses for girls. The Carpenters sold the school in 1978, and in 1982 Richard and Judith Harber bought it and installed the Mae Carden curriculum, which stressed fundamentals of grammar and math in the early grades, the development of analytical thought in later years, and the interrelationships of class subjects. The Harbers also added a preschool program. 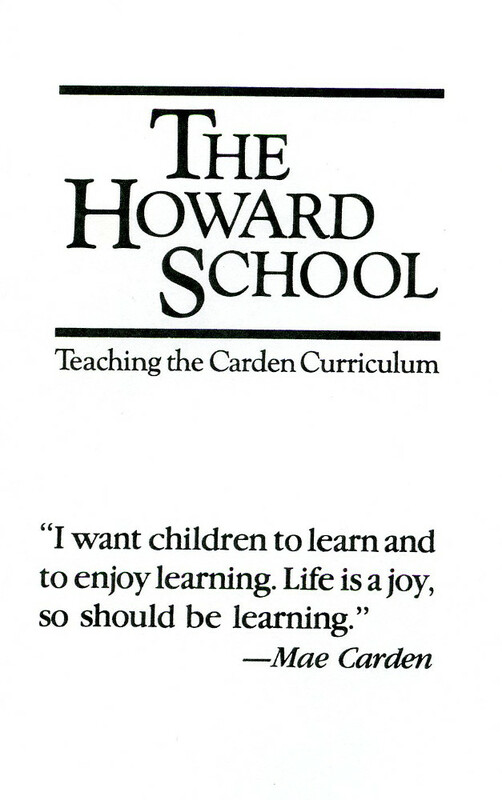 In 1999, Laguna Blanca School in Hope Ranch purchased a 10-year lease on The Howard School and announced its plan to end the Carden approach. The Howard School found a new home on Foothill Road in Carpinteria where it continues to offer the only Carden curriculum in the county.